The word biome was first used by Clements in 1916 (Carpenter, 1939), and is currently used to mean a community of organisms living together and essentially typical of a particular climatic region on land or sea. 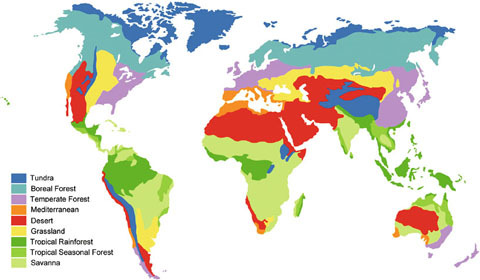 Specific soil types or associations develop in, and are characteristic of, the terrestrial biomes. In Figure B13 these are classed into the following groups: Tundra, Forest, Grassland, Mediterranean, and Desert biomes. Table B1 provides a summary of salient characteristics. For an excellent recent treatment see Woodward ( 2003). The principal sources used here for information on soils of the major biomes are FAO ( 2001) and Zech and Hintermaier‐Erhard ( 2007).